Stocks Large Build, Expectations were for a Draw. 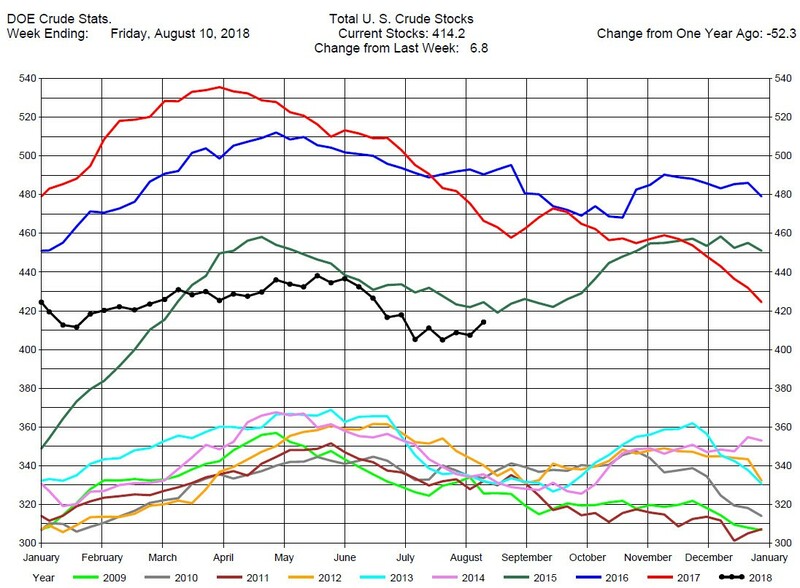 The DOE reported Total Crude Oil Inventories increased by 6.8 million barrels to 414.2 million barrels for the week ending August 10, 2018, while expectations average was for a 2.6 million barrel decrease. Overall hydrocarbon supplies increased by 17.4 million barrels to 1,227 million barrels. 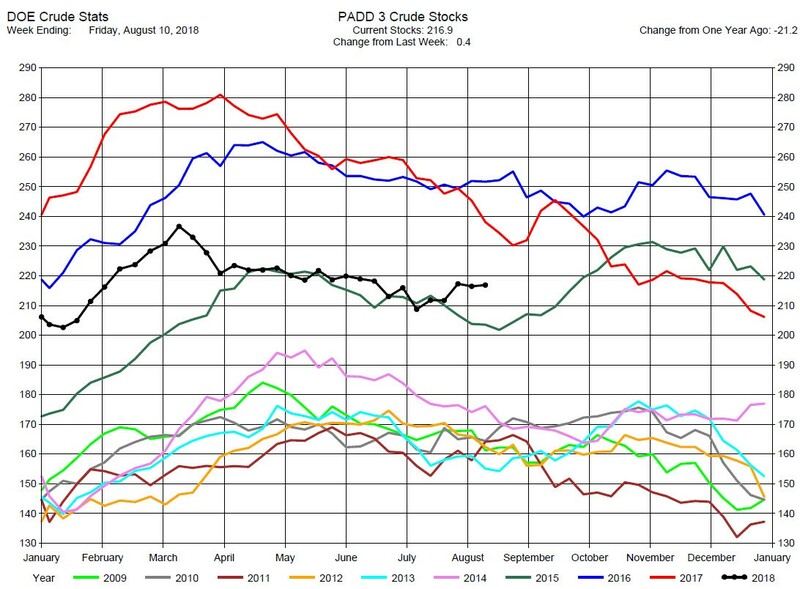 Crude Oil Production was up slightly by 100,000 barrels per day to 10.9 million barrels per day. 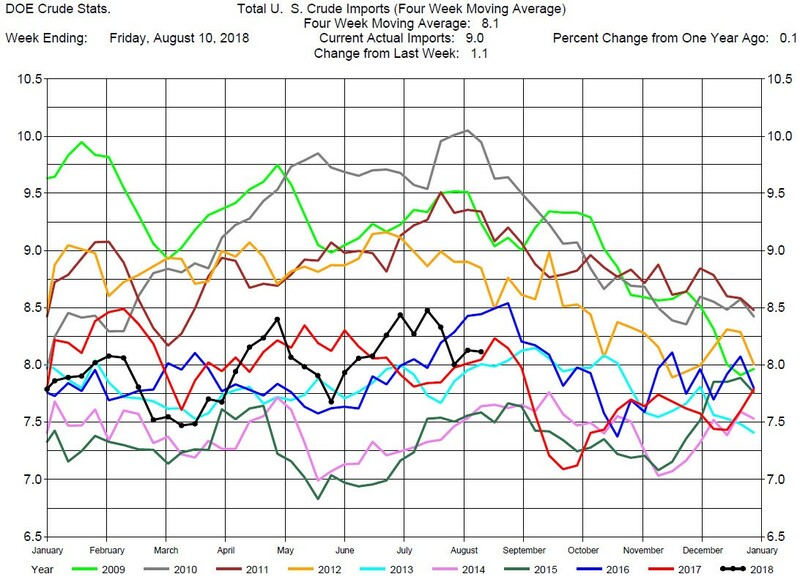 Total Crude Imports were up 1.1 million barrels per day to 9.0 million barrels per day. 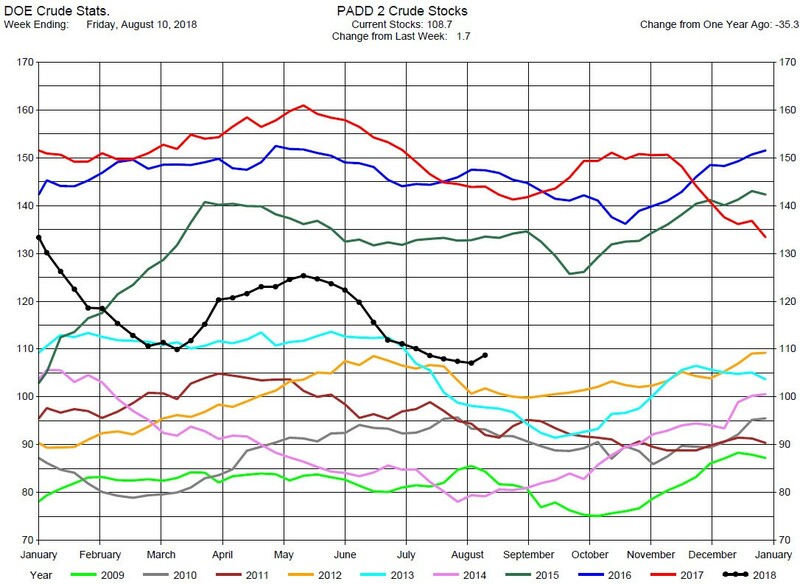 Total Refinery Crude Runs were up 400,000 barrels per day to 17.98 million barrels per day. 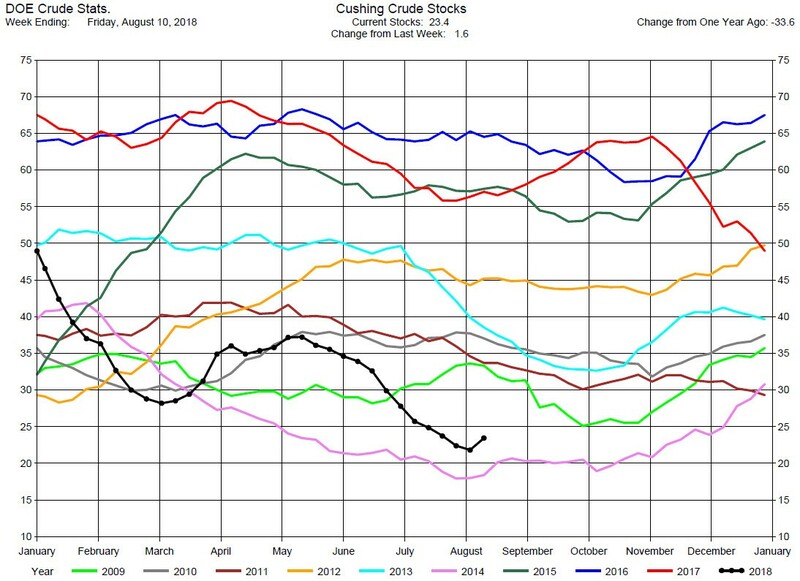 As with last week, the Crude Oil Stocks report was puzzling. 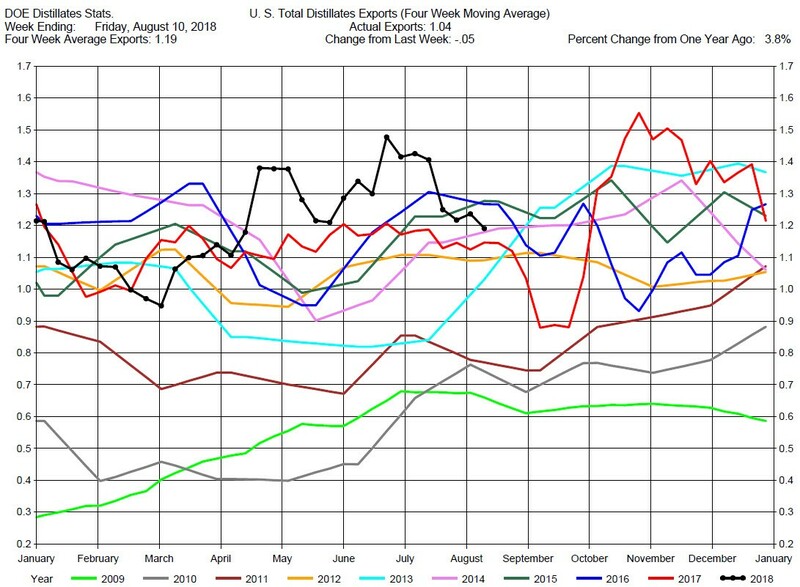 Crude Oil Production was 10.90 million barrels per day, Imports were 9.00 million barrels per day, and Exports were 1.59 million barrels per day, so the net Crude Oil supply was 10.90 + 9.00 – 1.59 = 18.31 million barrels per day. 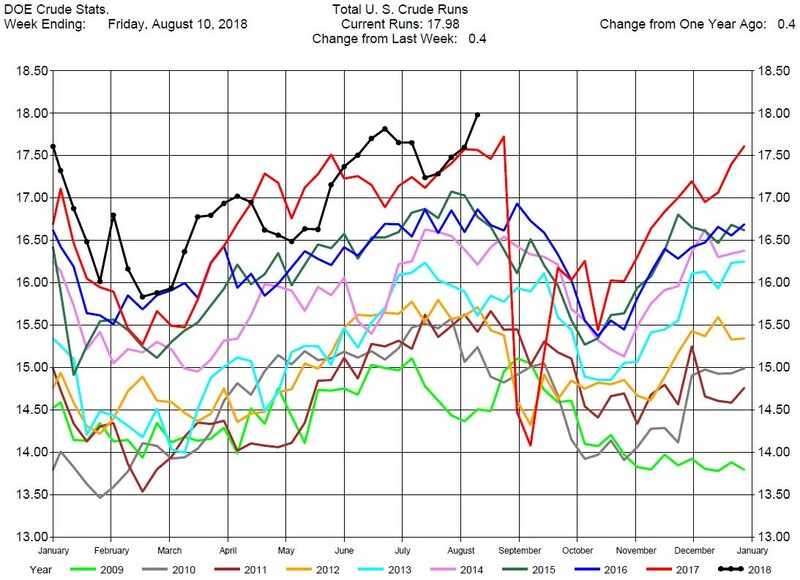 Crude Runs (demand) were 17.98 million barrels per day so the implied net build was 18.31 – 17.98 = .33 million barrels per day, or a 2.31 million barrels increase for the week. The DOE reported 6.8 million barrel increase. 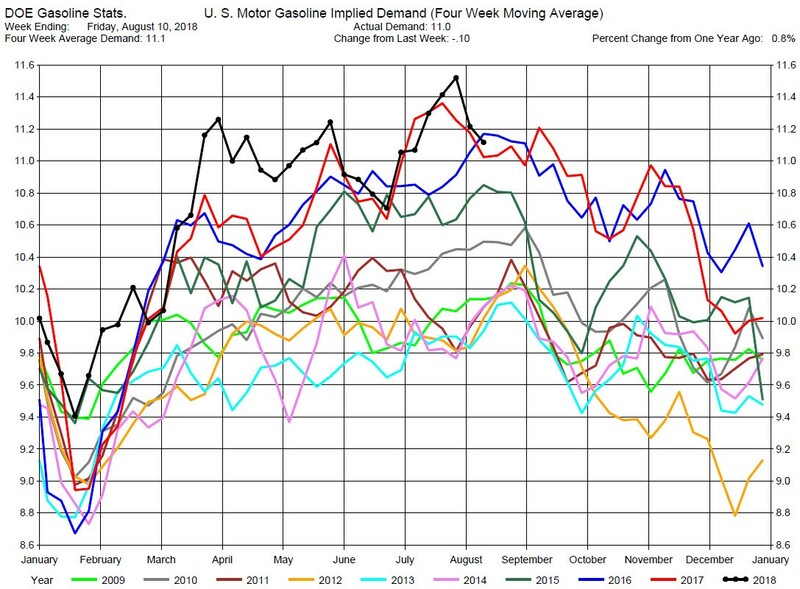 Regardless of the discrepancy, the DOE report was bearish to prices. Prices dropped 75 cents with the release of the report, and traded lower throughout the day, ending down around $2.00. We maintain our suggestion to not take trade positions in the near term and wait until a confirmed price direction is established. Stocks Draw. Greater than Expectations. 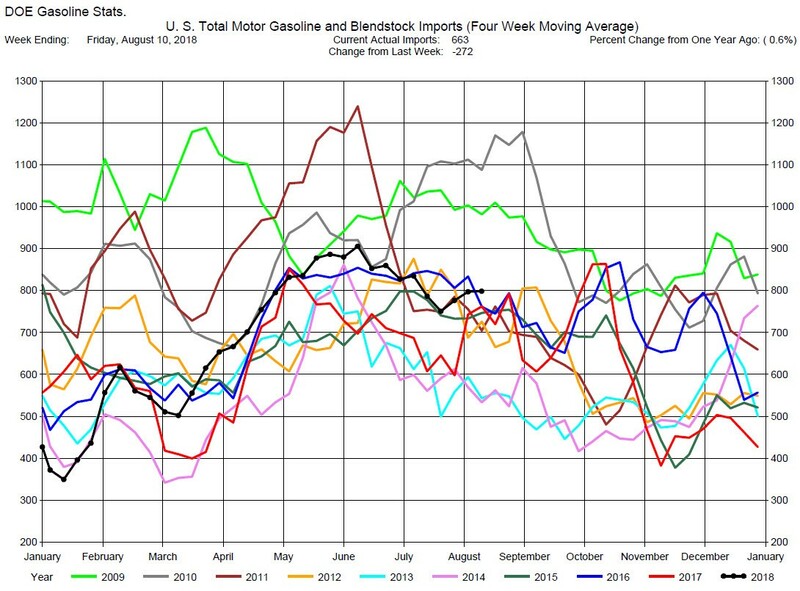 Total MotorGasoline Inventories decreased by 700,000 barrels to 233.1 million barrels for the week ending August 10, 2018, while expectations average was for a 500,000 barrel decrease. 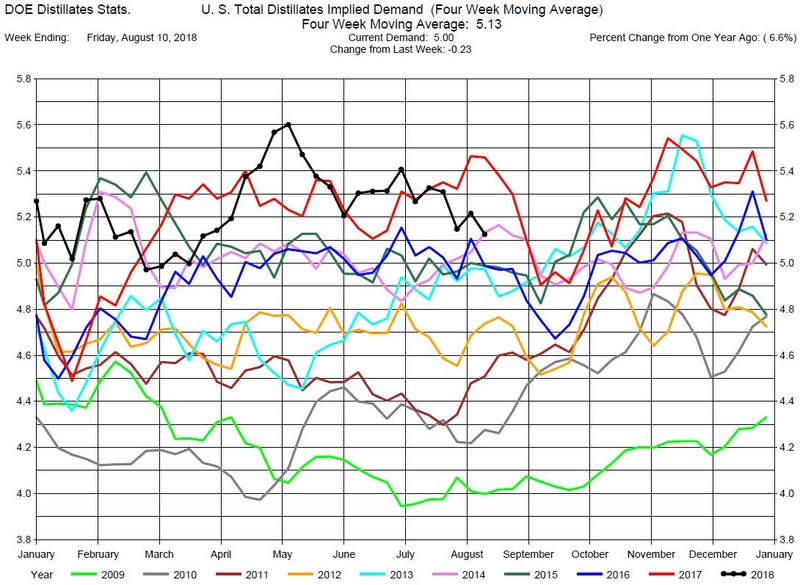 Implied Demand was off by 100,000 barrels per day to 11.10 million barrels per day. 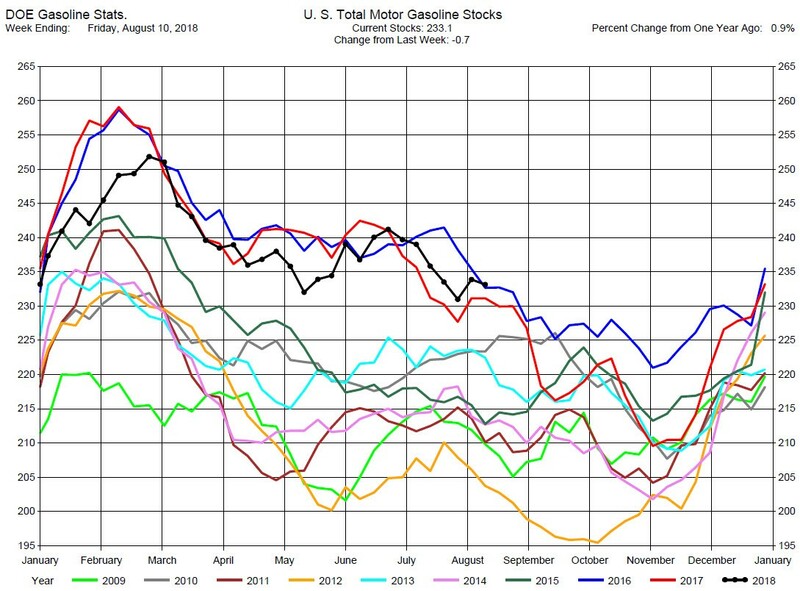 Gasoline Production was up 320,000 barrels per day to 10.23 million barrels per day. 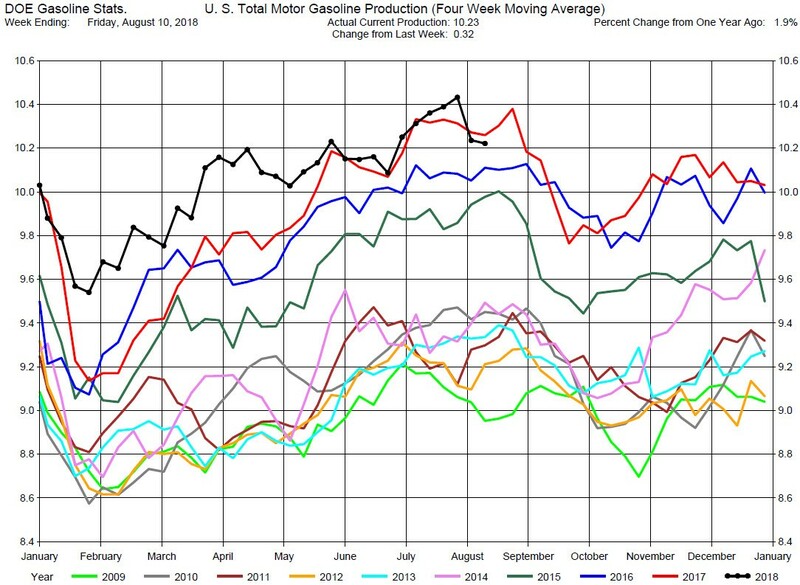 The choppy behavior of crude oil prices has increased the volatility in the gasoline crack spreads and calendar spreads. So while we still suggest considering long positions in the cracks or calendar spreads, this may be a time to wait for a confirmed price direction in crude oil. 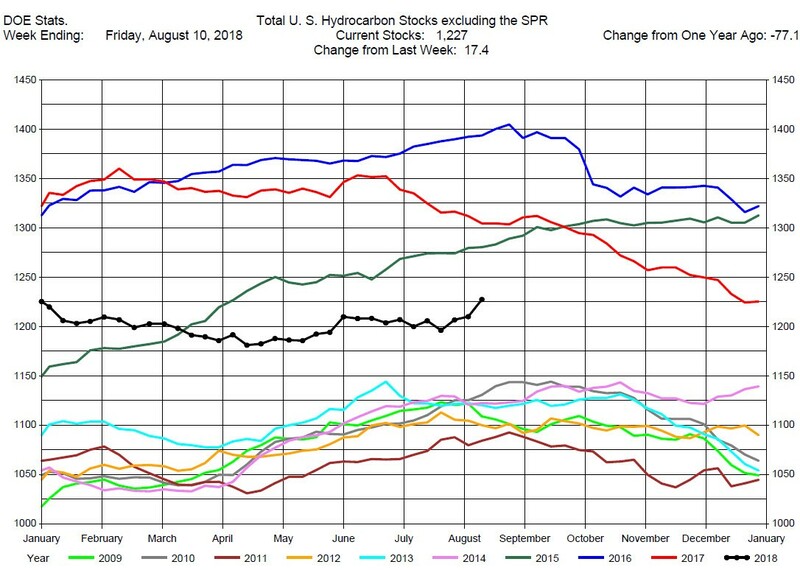 Total Distillates Stocks increased by 3.6 million barrels to 129.0 million barrels for the week ending August 10, 2018, while expectations average was for a 700,000 barrel build. 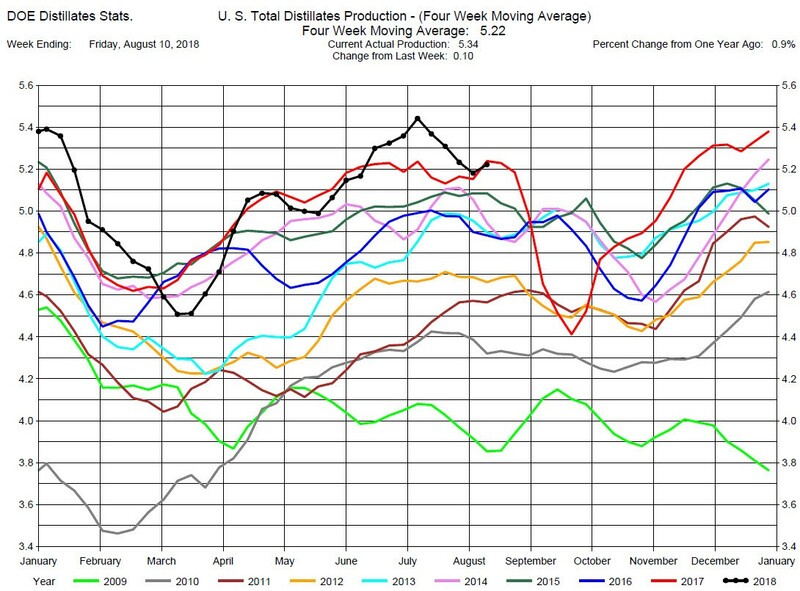 Total Distillates Production was up 100,000 barrels per day to 5.34 million barrels per day. 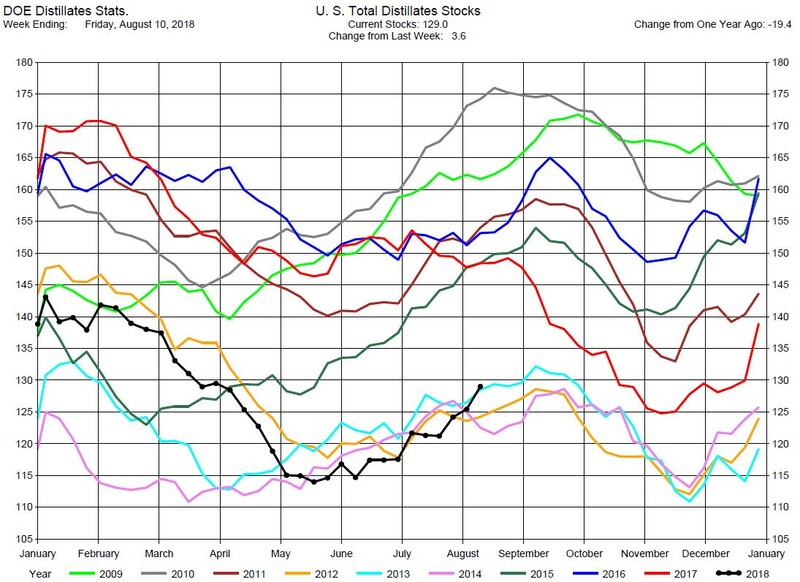 Total Distillates Implied Demand decreased by 230,000 barrels per day to 5.0 million barrels per day. The choppy behavior of crude oil prices has also increased the volatility in the heating oil crack spreads and calendar spreads. As with gasoline we still suggest considering long positions in the heating oil cracks or calendar spreads, this may be a time to wait for a confirmed price direction in crude oil.